Required Reading is DoomRocket’s love chest, where each week one of our contributors goes crazy over a book they just can’t seem to get enough of. Intrigued to find something new? Seeking validation for your secret passions? Required Reading gets you. 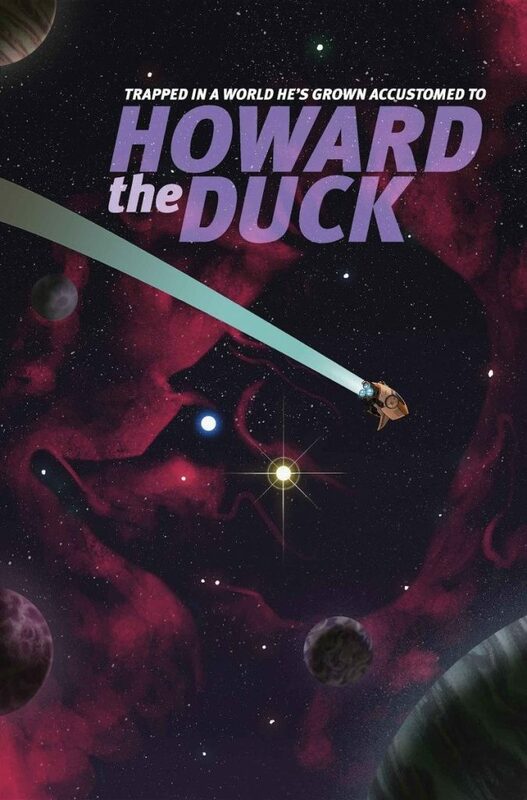 Cover to ‘Howard the Duck’ #2. Art by Joe Quinones. By Jarrod Jones. You already read it in the headline, but it bears repeating: “Our World”, by Chip Zdarsky and Veronica Fish, is one of the saddest stories you’ll ever read. It’s disarming. It’s arresting. It’ll play Operation with your feelings and abscond with your heart. And like any sad story, choosing the time and place to read it is key. I read it on a rather chilly December day this past year, so you’re perfectly in the right to believe that the mood of the season had something to do with how much the story laid me flat. After all, this is Howard the Duck we’re talking about, right? It’s probably more likely I just forgot to take my D supplements that week — how sad could it be? Toy Story 3 sad. Terms of Endearment sad. If you didn’t already know, here’s a tip: Howard the Duck is a book with the melancholy and heartache of a Peter Bogdanovich film, combined with the sass and hilarity of a particularly great episode of Pee-Wee’s Playhouse. No, I’m not kidding you. The premise of this issue alone ought to underline that sentiment. First, a recap: After escaping from nefarious cosmic hoarder, The Collector, Howard the Duck and Rocket Raccoon quack off to their respective corners in the galaxy contented to return to whatever passes for normal in their lives. Genetic samples, taken from them while they were in The Collector’s custody, were then used to create two female clones of our anthropomorphic friends: Linda the Duck and Sprocket Raccoon, who later show up to kidnap Howard, motivated by a hidden agenda. This issue is their origin story. Superficially, “Our World” is strictly Marvel Age, but emotionally? That’s another banana. “Linda & Sprocket: Who They Are, And How They Came To Be,” told as a poignant family drama set in the cosmos of the Marvel Universe. It’s a deep cut. A B-plot with prestige weight. Howard the Duck #1 left on a cliffhanger that promised far more wild action to come, and soon after it did, but Howard the Duck #2 shifted downward instead of ratcheting up. It took a time-out to dwell on the smaller moments, the little stuff. Interior page from ‘Howard the Duck’ #2. Art by Veronica Fish. Yet it still maintained Howard the Duck‘s narrative momentum. How Linda and Sprocket arrive fully formed as hard-assed space smugglers by the end of Howard #1 is covered in full with this issue. It addresses everything about them, from Sprocket’s anger, to that characteristic scar over Linda’s left eye. These sisters are strangers to the hostilities of the universe, and only come to know love through the kindness of their surrogate father (more on him in a minute). If Howard’s legendary existential plight came from his displacement in space, Linda and Sprocket’s came from being afraid in a world they never made. It’s A.E. Houseman’s “The Laws of God, The Laws of Man” spun on its head. In short, a perfect extension to the saga of Howard the Duck. What follows is one of the first gut punches of “Our World”, a startling shift in the story that makes the trio fugitives in the eyes of The Collector. Forced to lam it with The Collector’s Gatherers hot on their trail, Dee makes the decision to move his family twenty-five years into the past, which gives them all the time they need to grow together. (Also it allows for an awesome cameo by the Silver Surfer.) The years they spent becoming the best smugglers in the galaxy has the potential to become a series of its very own, it really does. Remember how I compared this story to Terms of Endearment? Linda and Shocket don’t have complicated feelings about their parent as much as Tommy and Teddy did, but child actor Huckleberry Fox’s splotchy red cheeks and sad, squishy face is all over this book. Artist Veronica Fish put so much of her heart into the story that you can practically feel it beating in your hands. In fact, her work is so effective, it gives the story’s more difficult moments — Linda gets smacked in the face by a Collector goon, as one example — that much more impact. You root for Linda and Sprocket. You want them to be okay, but you also want them to be happy. That’s the kind of effect “Our World” had on me. The issue’s conceptually perfect cover, by Howard the Duck‘s regular artist, Joe Quinones, underscores this story’s themes. Hope, nearly swallowed whole by an uncaring universe. Hope, found in the most unlikely of places. Howard’s glinting eye, a well of gravity pulling Linda and Sprocket towards it. Hurtling through the cosmos with little more than love to keep them going. Edited by Wil Moss, assisted by Chris Robinson.